Who doesn't love Christmas! Right? Well, besides Jehovah Witnesses the list is few and far between the majority of us who just love the annual celebration of a miracle baby born of a virgin 2000 years ago or maybe you're more into the big fat jolly man who comes down your chimney and gives you free goodies from Westfield. However the spirit behind Christmas is about family, friends, giving, getting and of course eating yourself into an annual food coma! The one day gluttony affair is somewhat socially acceptable. Yet the preparation and stress of cooking for the entire family can leave one saying "Crap! It's Christmas!" And as if the end of year school award nights, multiple Christmas parties (with lame secret Santas), dance concerts, gift shopping and so on isn't enough, you are expected to cook for the entire family! Please, no wonder it can be stressful! So to help you combat this burdensome silly season here are my top tips for a smooth Christmas which you can sit back, relax and actually enjoy! Get prepared! If you find yourself peeling potatoes, slaving over the stove and baking those few last gingerbread men, do yourself a favour and do it all days before. Prep all your vegetables, salad dressings, stuffings and fruit the day before. Even set the table the night before along with all your serving dishes out and ready to go. Ensure your kitchen is fully prepared as well meaning the dishwasher is empty, fridge is clean, drinks are in the fridge and so on. Go Cold: Ok, if you live in Australia you will know Christmas day can get over 40c degrees! So save the traditional pork roast, vegetables and steamed pudding for Christmas in July. Go cold this Christmas by embracing locally sourced seafood like prawns, oysters, salmon, snapper fillets and if you want to go even more fancy try blue swimmer crabs or succulent lobster with garlic butter. Some lightly barbecued charred vegetables dressed with olive oil and sea salt or go with my delicious fresh peach salad with cos just because. Salads will save you time and the stress and are something which can tossed together in a matter of minutes with huge flavours. 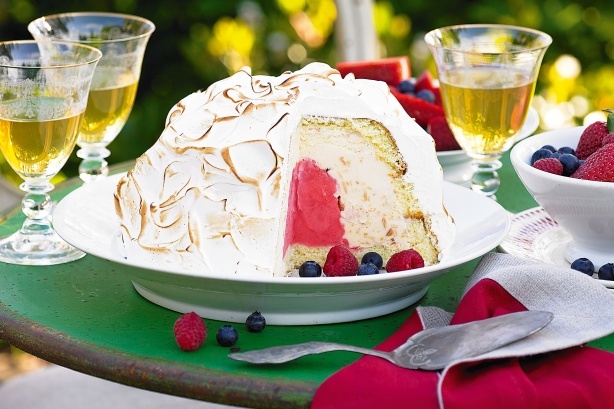 For dessert this Christmas, I cannot recommend this Orange and Berry Bombe Alaska enough. It changed my life (dramatic, I know) and the best thing is, you can make it weeks in advance! Wham Bam Glazed Ham: Don't be scared of a glazed ham! This show stopping table centrepiece is sure to impress all but your Jewish guests! I just love glazed ham. The salty meat with it's smokey undertones pair so well with anything sweet really. Each year I come up with a new glaze combination for my Christmas ham like red cherry and rum, or clementine, vanilla and clove or this years one, sticky fig and brandy! The best thing about a glazed ham is you can do it all the day before! Check out my recipe below for my Christmas Ham for 2017! Keep the fat on the ham but remove the rind. Simply peel the rind off the fat. Lightly score the fat with a knife - don't score too deep. In a medium saucepan over low heat add 370g fig jam, 1/4 cup brandy, 3/4 cup orange juice and 3/4 cup brown sugar. Stir till the sugar has dissolved and well mixed. Paint the glaze on the ham and place in an oven on 150c for 45 minutes. Re-paint the ham with the glaze every 10 minutes. For that little food styling touch, add star anise on the scored ham. Enjoy hot or cold! So there you go friends, just a few tips and hints to ensure you have a stress free Christmas that doesn't leave you frazzled and hating the multitudes of family you just fed!